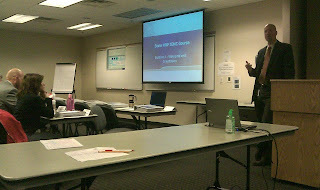 Alright, so we made it through the first day of our State-level Integrated Emergency Management Course (IEMC). 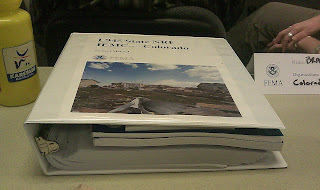 With nearly 60 students and instructors occupying a windowless basement training room, each presented with an impressively heavy course material book (pictured), first impressions were that the day had the potential to be an uncomfortably long slog. Ask anyone in the room at the end. It wasn't! It was a great first day! If you are not familiar with the IEMC, it is a class offered by the federal Emergency Management Institute and is designed to provide a structured training environment and realistic exercise(s) for emergency operations center (EOC) staff at the local and, in our case, state-levels. Unlike a normal emergency management course where personnel collect in one room from various backgrounds who often do not work together, this course is a specifically-formulated and targeted for a unique EOC and its operating staff, using hazards those staff are likely to face and which is tailored to the EOC's operations environment. With just the right number of State Emergency Operations Center and Field Staff and with a number of partner agencies - including from transportation, health, nongovernmental and private sector - the room was well-balanced for a Colorado team training exercise. Like any training course, the initial modules introduced the participants and covered the broad, overview information related to the National Response Framework and the National Incident Management System. What made the training unique was that, between an active senior-level direct participation (the State's Emergency Management Deputy Director Bruce Holloman is both a student and presenter at the Colorado Course - pictured) and an EMI instructor cadre who was both incredibly personable and whom had clearly done their homework on Colorado, the material bridged the gap between doctrinal structure and on-the-ground implementation. Example? One of the more handy, one-pagers distributed was an org/information flow chart that provided a birds eye view of incident information flow during a large-scale incident (embedded below) that involves local, state and federal resources. For each big-picture concept there was specific discussion, presentations or material then provided that were Colorado-specific. The above chart was quickly complimented by understanding how Colorado's Emergency Operations Center basic structure is organized. The intent of the course is clear. The intent is to explore and evaluate how Colorado's system integrates into the National Response Framework to improve leadership, management, efficiency and communication. I have embedded a copy of the EOC structure chart for the Thursday exercise below. These two documents give a solid understanding - even to the rookie field - of the basics of our organization, lines of communication and where to go for information when responding to a growing or large-scale incident. While we covered the "how" of incident management via the National Incident Management System (NIMS) and the "who" of incident management articulated in the National Response Framework (NRF), the Emergency Management Institute instructors did so in a manner that made the terminology, with which many in the room were familiar, in a new light. By using specific examples of instructor participation in past, large-scale events they were able to relate in a personal manner how the concepts spelled out in both the system and framework were developed, refined and are currently being implemented. 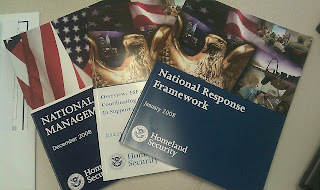 If you are not as familiar with these concepts, a quick run-through of http://fema.gov/NRF is highly recommended. In addition to the instructors, a representative Federal Emergency Management Agency Region 8, which is located in Denver, also provided a history of emergency management legislation. Using the context of the recent Colorado fires, this presentation spilled into an opportunity to discuss how decisions, such as damage assessments that factor into individual and public assistance, factor into the planning, response and recovery process. The afternoon is where the course became really interesting. As a way of reviewing material and testing, the instructors used a TV-style, quiz-show game - complete with on screen interactive displays of status - to review material. With categories focused on Roles and Responsibilities, Response Actions, Response Organizations, Planning, the Incident Command System and the National Incident Management System, the interactive style worked and had everyone engaged. In addition to the quiz show, there was a comprehensive presentation made by our State Planning Officer to the group on Colorado-specific hazards. I think the briefing was one of the better presentations I have seen on the subject of which hazards we face here, be they a wildland fire, avalanche, rockslide or tornado. I have asked our Planning Officer for an electronic copy and will post it as soon as I get in here on our COEmergency site, probably tomorrow. As for tomorrow, the plan is to progress from the big picture and get into all-hazards emergency planning, situational awareness and common operating pictures, a couple of tabletop exercises. Keep checking back! Our intent over the next few days as we progress from the introductory briefings and into the tabletop and exercise(s) scheduled for later this week is to provide an informal look-in on what our experience is with the course. We will be posting photos, resource links and other materials as we go along!